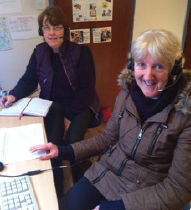 The RISE Project runs the friendly call service based at the Ballagh Centre – Rossinver Calling which serves North Leitrim, North Sligo and West Cavan. This service provides social contact and re-assurance to older people and their relatives. This free call service will telephone an older person at a regular pre-arranged day and time, check that all is well and have a chat. Calls are made by trained and vetted members of staff and volunteers and the content of the calls are strictly confidential. Unlike emergency pendants or helpline services, this friendly call service doesn’t wait for the older person to report a problem. It is a pro active service - if the older person doesn’t answer the phone at the pre-arranged time or if they answer and seem distressed or unwell, the phone service operators will respond by alerting their family members or neighbours. This can provide particular re-assurance if the older person is living alone in a rural area, prone to falls, wandering or has other health issues. The social contact the service provides is invaluable. To know that there will be a friendly, known and trusted voice that has time to chat about the weather or some local news can make a big difference; for some older people it may be the only conversation they have had that day. The service is free and referrals are welcomed from family members, health care professionals or from the older people themselves. For further information please contact the centre.